Huawei has launched the Huawei Watch 2 (2018) in China. As its name implies, this is a sequel to the Huawei Watch 2 released just over a year ago. In terms of hardware, the only thing that separates the two is eSim Support. The official press renders of the smartwatch were leaked a couple of weeks ago by Venture Beat tech journalist Evan Blass. A well known tipster, he comes with an excellent track record when it comes to predicting these sorts of things. The watch is official now. Just like on the Apple Watch, the standard SIM slot of the original has been replaced with eSIM. You’ll be able to use Huawei Watch 2 (2018) as a standalone device, check for calls or messages and stream music, even if your smartphone is not around. This new eSIM option comes exclusively in the new “Carbon Black” color variant. And for now it only works in China. The other specs are identical. The 2018 edition sticks with a 1.2” AMOLED touchscreen and 390 x 390 resolution. Under the hood is a Snapdragon 2100 processor, 4GB RAM and 768MB of built-in storage. And you get the whole gamut of sensors including an accelerometer, gyroscope, barometer, GPS, heart rate, ambient light, geomagnetic and capacitance. 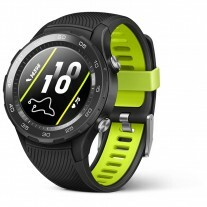 Huawei Watch 2 (2018) also keeps the IP68 water and dust resistance from last year. The 420mAh battery will keep it ticking up to 3 days with mixed usage and 25 days in low power mode. ← Welcome back Withings! Nokia sells its ailing health division.